Frank Thomas, the future head football coach at the University of Alabama, was born in Muncie, Indiana in 1898. His father, an iron worker, moved the family to East Chicago six years later in search of employment. The young Thomas became such a standout high school athlete he skipped his senior year to enter Kalamazoo College in Michigan. After two years there his prowess on the gridiron caught the eye of Notre Dame great Chipper Smith who contrived to get him admitted to his Indiana alma mater. 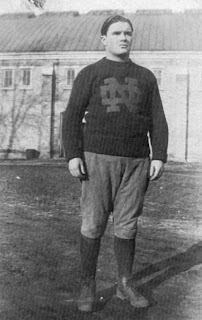 Arriving in South Bend in1919, Thomas was part of the Notre Dame freshman squad and gained the notice of second-year coach Knute Rockne. Thomas served as a third-string quarterback on the undefeated 1920 team, playing in five games. His roommate was star George Gipp and the two played professional baseball in the off-season. (Thomas and many other Notre Dame players regularly played professional football on Sundays as well.) Gipp's sudden death from a throat infection in December of 1920 affected Thomas deeply. "I broke down and cried like a baby," he later said. "It was like losing a brother." Thomas was a staple of the Notre Dame roster for his junior and senior seasons which saw the team go 10-1 and 8-1-1, respectively. (Late in the 1922 season Rockne shuffled the starting lineup, switching Harry Stuhldreher for Thomas and creating the group that Grantland Rice would dub "The Four Horsemen" two years later). Thomas' on-the-field decision making earned him the praise of Rockne who called Thomas "a fine field general." "It's amazing the amount of football sense that Thomas kid has," Rockne told his staff after one game. "He can't miss becoming a great coach some day." After graduating in the Spring of 1923, Thomas was contacted by the University of Georgia and subsequently hired. As the bulldogs' backfield coach, he was entrusted with importing Rockne's dynamic "Notre Dame Box" offense to southern football. After a stop as head coach of University of Chattanooga, Thomas was tapped for the head coaching position at Alabama in 1931 following the surprise resignation of Wallace Wade. The Notre Dame alumnus would lead the Crimson Tide a 115-24-7 record, six bowl games and two national titles over the next fourteen seasons. Thomas' Notre Dame playbook from 1921 has been preserved by the National Single Wing Coaches Association who still use many of its precepts at the high-school level. Hi there - Family legend has it that my great uncle Joseph Werner played Univ of Alabama football in the 1930s. I'm trying to track down some detail about his time at Alabama... any suggestions or leads?